During this workshop, participants will learn the details of using the iPad to edit audio and video to create student centered classroom projects. Emphasis will be placed on using Apple's GarageBand and iMovie along with other media creation apps. The first part of the session will be focused on learning the tools while the last part will be focused on using these tools to create a mock student project. Participants should bring an iPad with iMovie and GarageBand installed prior to the workshop. An iPad 2 with iOS 8 is preferred. iMovie - Trailer vs. Movie. Trailer is a pre-made video with a storyboard included - you pick the footage to include and it automatically makes the movie. With trailers you have little control over edits of your videos. Movies are free form and you have control of all of the edits and lengths. Smart instruments (gear) vs. instruments - smart instruments can automatically play chords and patterns for you. The regular instruments require you to be able to play - know the keys, frets, etc. to produce music. Layer instruments by switching to the track view. Encourage students to plan out their video or create a storyboard containing all of the scenes and necessary plot info for their video. Here are a few other video and audio creation apps which can be used in conjunction with iMovie to create movies. Almost all of these apps allow you to save a video or audio project which can be brought into iMovie to use with your movie creations. This session will explore the ways to share, receive, and organize documents in Google Drive. 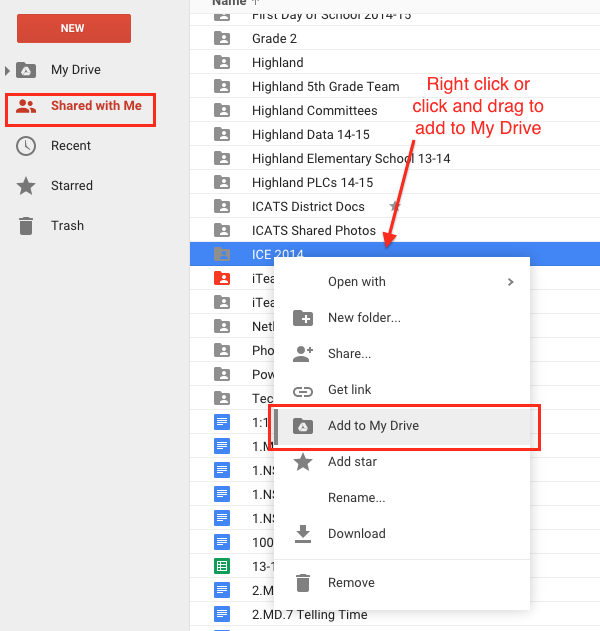 Once you are logged in to Google Drive you will see your Drive. The search bar at the top allows you to search any items in Google Drive. The sorting options and settings, allow you to change how your documents looks, how they're organized, and adjust Google Drive settings (the gear). To create a document click on the red New button to see the available items you can create. 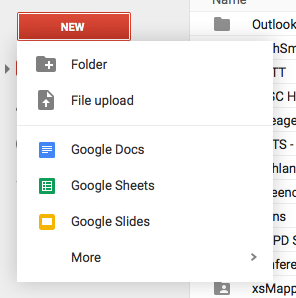 With the New button, you can create a Folder to organize your files, upload a file, create a Google Doc (like Microsoft Word), Google Sheet (Like Microsoft Excel), Google Slides (like Microsoft PowerPoint), and under More are Google Forms and other apps. 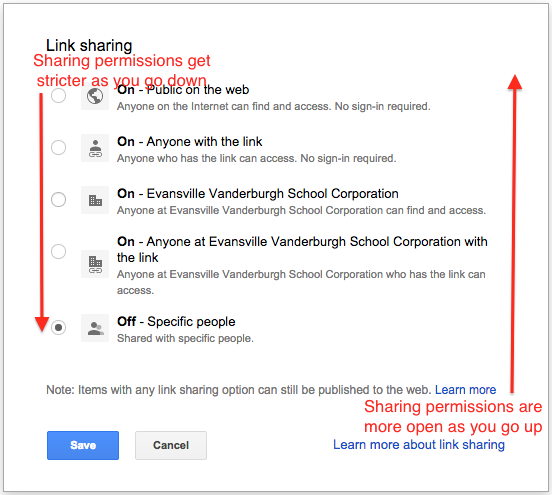 Once you know what you want to share, you have a number of sharing options available. The following Advanced features are available by selected Advanced and then clicking Change under the access section of the sharing screen. Off - Specific people: means that no one can see your document or folder except for you and the people you have added and invited to the document. This is a good option for sharing with your team. On - Anyone with the link: means that anyone you share the link with can access the document and you can decide if they can edit or just view. This is a good option for sharing with parents or community members. On - Public on the web: means that anyone on the web can search for and find your document in a Google search. If someone has shared an item with you but you are having trouble locating it, consider adding it to your Drive instead of leaving it in the Shared With Me section. Once the item is in My Drive, you will no longer have to search for it in Shared with Me. It will appear in My Drive and can be organized in folders within your Drive. Be sure to set your Google Account email to forward to Outlook so you don't miss a notice that someone is sharing with you. Click Here for direction. Consider giving an item a Star by right clicking on the resource and select Add star. This will put the folder or document in the Starred section of your Drive. Consider switching the view of your Drive from List to Grid View (top right) to see better visually what's in your Drive. Consider installing the Google Drive on your computer at this link. This program will make Google Drive work like Dropbox and put an actual Google Drive folder on your computer which will sync up to your Drive in the browser. Consider installing the Google Drive iOS app on your iPad, iPhone, or Android phone. This app will also allow you to view and edit Google Docs on your mobile device. Download it here. Preparing to Use Technology in your Classroom - Avoiding "The Technology Fail"
I think we have all been there at one time or another. I'm talking about that day when everything seems to go wrong with your exciting and innovative technology-driven lesson. As you prepare, you think to yourself, "If only I could be having my observation today, my principal would be wowed!" The lesson begins and starts off rocky and goes from bad to worse - yikes! Most of the time we hear other people, I mean ourselves, say, "You just can't count on technology! 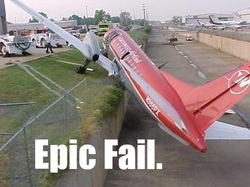 Technology is just not reliable! This never happened with paper!" I think if we're honest with ourselves, we would admit that we could have done more preparation prior to the lesson to help ease the frustrations and failures that we experience. Below are some tips that I have assembled from experiences I have learned by getting burned a few times. I hope these ideas will be helpful to you as you begin to plan "exciting and innovative technology-driven lessons." Read all of the fine print when signing up for or trying a new tool. Sometimes the free version limits you when you try it out on a bigger scale. For example, services that limit you to 10 users and you try it with a class of 30. Provide students with login info prior to logging in. Depending on the age and ability of your students, they may need this info on a login card. This greatly reduces teacher stress if you they have something for them to look at as they login. If they have multiple logins, have them all on a card for future reference. Try out a couple of student logins to make sure they really work. Sometimes the first activity with a new website or tool is just logging in or getting there. Students can benefit from the practice, especially the younger ones. If you have login issues, this gives you time to figure out why they are not working. When using online programs, create a fake student or two (if you can) to really try out a service to make sure it does what you expect. It's also good to help you know what students will experience when they start using a program. You can even login with this fake student account to demo the steps your students will take as they login. Start out students on paper to help them understand what they will do once they get online. I recently read about a teacher who had her students blog on large banners and other students added sticky notes to teach blogging and commenting. This teacher understood how to break down the concept of a technology skill in a way that was readily accessible to her kids. Did I just suggest starting a tech project on paper - oh yes I did! Start with the end in mind just as you do with any lesson planning. Decide where you want your students to go and go to the beginning and begin teaching. We know our are kids with smart with technology but sometimes they still need coaching and help getting started. After you know where you want to go, start at the beginning - Today we're logging into X, Tomorrow we're learning how to [fill in your objective] with X, Next we will begin . . . Break it down into manageable pieces and work to the end. Don't plan something big for your first time with a new tool or device. The first day should be devoted to logging in, logging off, and the basics of using the tool or device. It's not advisable to start with a real assessment or assignment at the beginning. In fact, I would probably give a 'fake' assessment or project a few days after they start to get familiar with a program. Try a program or tool on the actual student device you will be using in class. It can be tempting to just try something only on a teacher device but sometimes filtering differences, flash updates, system updates, etc. create chaos in your room. It's good to find out that a plug-in or update isn't installed before you launch into that lesson and get stuck in update city. Always be prepared for Plan B. In spite of all of the best preparation there are some situations you can never control. What happens if the power goes out? What if the internet goes down? What if the site you are using is overloaded when you want to use it? All of these situations are completely out of our control but are often times rare. It's good to have an idea for how you would do the work without technology, if something should happen. Be prepared to grow when using technology in lessons. 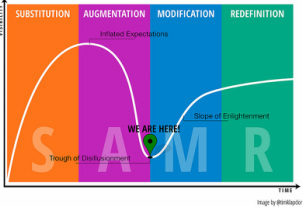 Effectively using technology does not happen over night. For most of us it takes many lessons, a lot of trial and error, and some hard lessons learned along the way. This shouldn't come as too much of a surprise, we are in fact teachers. We know that as soon as we step in the classroom everyday, we have a whole new set of challenges from which we can learn and grow. I know this sounds like a lot but I believe it's worth it to make sure your lesson flows smoothly. The best compliment I think we can be given during a lesson, is that the technology took a back seat and learning was front and center. I hope these tips will help to put technology in back and bring learning to the front! Best of luck as you teach with technology! 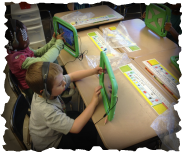 Thinking about iPads for your School? As schools consider the purchase of iPads for the classroom I thought it would be good to share some tips and lessons learned. Many of these ideas come from our 2 years of learning and experiences with deploying over 500 iPads in our school. Talk about how you plan to use iPads - cart setup, take home, assigned to each teacher or rotating through grade levels, etc. For a shared cart scenario, decide how those carts will be used - check outs, how will they be fairly used among staff members, etc. Which staff members should have iPads? Only certified? All instructional staff? Title staff? Long term subs? Decide before they go to too many - it's harder to take them back! Will staff be allowed to take devices home for the summer? If student devices leave the building, do you plan to purchase insurance? Apple Care+? Plan for a budget of Volume Purchase Program apps. This is different than an iTunes card. Decide how you want to setup devices - How many Apple IDs? Apple ID per grade/class/school? How do you want to sync - wirelessly is the best option for more than about 50. You will need to purchase a MacBook that should be set aside for set up and configuration of the iPads - no one else should use that device for any other reasons. This is especially important if you are using Apple Configurator for the initial setup. Before setting up multiple iPads, take one iPad and setup the features you would desire for it to have - Turn on Guided Access, turn on Speak Selection, or any accessibility features you think your teacher and students may use. You can add a wireless password too. Once this iPad is setup, you can use Apple Configurator program to make a backup and apply it to all the others. Even if you don't use carts, it might be worth purchasing a Bretford Sync Tray or another syncing device so you can setup mutliple devices at a time and lock up devices not in circulation. Decide on a naming scheme for iPads: Smith Grade 5 - Student 1 or 1st Grade #1, etc. Devices can be named sequentially with Apple Configurator. The name is important for using something like Filewave to determine one device from another. Start with some basic, general apps like Google Earth, QR scanner, Google, Socrative and have them pre-installed on iPads. It's nice to have something on it ready to use for that first time in the classroom. Consider doing a digital citizenship rollout process with the students as they begin using iPads. Ideally, it would be great to talk to each class and share some tips, safety/maintenance guidelines, and appropriate use. Allow students to create their own unique lock screens which help identify the iPad owner - especially great for a true 1:1 scenario. Include name, photo, artwork, and/or number of iPad on the lockscreen. If you or your school have some other ideas, feel free to share them below in the comments. It's great to learn from each other. I would be lying if I said I learned all of the above from trial and error. I have been able to learn from many other people working through a similar process and coming to new conclusions I had never considered. I wish you all the best as you investigate using iPads in the classroom! This is one of those things that many say they can't live without on the iPad. The more I use technology and look for ways to use it in education though, the less I feel the need for a word processor. Typing things seems so flat compared to all of the great things that can be done with this technology. I did encounter a few moments where I did actually have to type something. Google Drive and Pages were my go-to apps. This seems like the simplest part of the experiment but I have to say this was more challenging for me. Right or wrong, I function out of my email account for reminders and my "To Do" list of the day. Throughout the day notifications come up reminding me of appointments and my To Do list items on my Mac. I am also on several email lists. On my Mac, I have email rules to move many of those messages out of my inbox to deal with later but sadly there is no way to filter those messages in iOS Mail. It seemed like I was deleting email all day long! I also find it easier to miss appointments and To Do items since there is no way to 'Snooze' the notifications on iOS. There may be an app for this but I'm holding out for some improvements in a future iOS Mail update! About a month ago, I moved all of my documents from my Mac over to an online cloud service (like Dropbox, Box, Google Drive). Any documents that I needed were accesible in an app for that service. Thankfully, more and more apps give you the ability to "Open in . . ." another app. This definitely makes it easier to work with any documents that were already uploaded. Maybe it was a strange week or maybe I'm really creating a paperless workspace but I did not have a need to print much this week. I had one district form to print out and submit and I used the Printer Pro app to do that. For the most part, I don't have a huge need to print much of anything let alone print from the iPad. I realize that may be different for other schools and work environments. One thing I did not miss this week was continually updating Flash for my browsers! With that said, Flash is another common place where people say they cannot commit to full iPad usage. I was pleasantly surprised by how many sites have modernized to not require Flash to run their site. For sites that would not run Flash, most of the time they offered an app. I can definitely get by without Flash but I know there are still a number of educational games that are still running Java and Flash without an app substitute. For the rare moments when I absotultely needed to have Flash, I used the Photon App to provide a browser running Flash. I want to share my setup with you. I do have a Logitech Ultra Thin Keyboard but for the week I used a Dell USB keyboard connected with the iPad Camera Connection Kit. I found a cheap 2 in 1 connection kit on Amazon and it works great. Surprisingly, I'm ready to keep going the rest of the year with just my iPad. I will have my MacBook nearby and ready to filter out email and of course access those only available with Flash or Java sites! I cannot wait to see how much more I learn about using the iPad with continued serious use. Can you make it a week with only the iPad? I would especially love to hear from some classroom teachers if they think they could do it and how this could change the way you teach! Since publishing this entry I learned that our Outlook Web Access allows for rules to be created at the server level but only when using the full web version on Internet Explorer. I had missed this previously because I only use Chrome and Safari on the Mac. I now have my lists filtered out of my inbox and my iOS Mail is much happier! At the end of the challenge I want to share my findings, struggles and successes with the iPad - look for something next Monday! In case you&apos;re wondering, I am adding this blog entry with my iPad and the Weebly app for iPhone. Ironically my website is not easily edited with an iOS device! I am excited to see what will come of this challenge and what new ways I will learn to use this device that I already enjoy and respect as a tool for productivity and fun! For this last tool I thought I it would be good to focus on something that many of us are already familiar with using. YouTube is one of those tools that most every teacher uses throughout the day. Since next week is the last week, I thought I would share this one early and give you some time to turn in your participation sheets. If you participated in the challenge, turn in your sheet to my box by Tuesday, December 18th at the end of the school day. I hope you have learned some things along the way and have enjoyed these tools. I will keep these on my blog so you can refer back to them at any point. Thanks for participating!